Simply put, a Midlife Awakening is the phase where women transition through the midlife years. It’s a time of tuning into yourself, discovering who you are, and stepping into your power. It happens for all women and, typically, it starts in the late 30s (but since everyone is different, it can hit a little earlier or later). I’ve talked about it before, but basically, it’s when you start to feel unsettled in your life, and new questions start taking root in your mind. How can I feel more fulfilled and as if my life had meaning? Newsflash, women aren’t like men. While men go through a midlife crisis, women go through their own midlife transition. But, women aren’t in crisis mode, and as I’ve talked to women in this phase of life, they really don’t resonate with the word ‘crisis’! For women, the Midlife Awakening is a period where they come alive and awaken to who they truly are and what they need in their lives to fulfill their deepest cravings. While it’s certainly a challenging time, it doesn’t have to be a bad experience. It’s not comfortable to question the life you’ve been living up until now, but with these questions comes new answers. These solutions allow you to see the possibilities for your life in a different light. What you do with that information is entirely in your hands - file it away, do nothing and regret it later. Or, embrace it, face your fears, and forge a new path. It’s not comfortable to question the life you’ve been living up until now, but with these questions comes new answers. If you are experiencing some of these feelings, trying to find resources to navigate this tricky phase can be a challenge. There isn’t a lot out there for women experiencing these feelings and asking themselves these questions. Since I’ve been going through my own Midlife Awakening the past few years, I put together a resource list to inspire you to find your answers and create your new path. This list is not an end-all-be-all list. It’s what has worked for me. What will work for you may be something entirely different, so if some, or all of these, don’t resonate with you, use these as a springboard to find what does. As with anything, if you want to create change you have to be open to learning new things and, more importantly, to being uncomfortable. If you stick with what you know and stay comfortable, you simply tread water and never move forward. The best piece of advice that I can give you is to open yourself up to new ideas, new practices, new theories, new mindsets, new experiences, new people, new places, etc. The more ‘new’ you can experience, the better! If you’re uncomfortable with your life right now and feeling like it doesn’t fit, that’s okay! You have the beautiful opportunity to go out and find what does fit. Remember that we’re all unique and there will never be a perfect checklist that applies to everyone. Be inspired by others and tweak it to create your own recipe of what works for you. The best thing you can do is to learn, so for me and my journey, I sought to do just that (and I’m still learning!). The personal development section on Amazon or at your favorite bookstore is an incredible resource for inspiration! I have SO many books lying around my house that I still need to read because there are so many good ones out there! The Midlife Manifesto by Jane Mathews: I read this entire book on a flight to Ireland last year! In The Midlife Manifesto, Jane touches on all areas of life and discusses her experience along with providing practical suggestions for looking at things from a new perspective. The goal is to create a manifesto for your life (I didn’t really do that part, but love the idea!). Like me, she doesn’t see women in crisis mode when transitioning through these years, so it’s positive look at how to change things up. Big Magic by Elizabeth Gilbert: Big Magic has nothing to do with navigating your midlife years, but what it does provide is inspiration for living a more creative life. Now, that doesn’t mean you have to pull out your paintbrushes or set up a craft corner in your house! Creativity comes in many forms and allowing it to flourish in your life gives you the ability to see the world differently, generate new ideas for your life, and achieve goals that you didn’t believe you could hit. My biggest takeaway from this book is to follow your curiosity. It’s become a personal mantra because there’s SO much to learn from the world around me, so following what makes me curious opens my life up to so many new things. Design Your Life by Bill Burnett and Dave Evans - If you’re looking for a new career, this is a great book for approaching it from an entirely different angle. I loved the exercises and, personally, I feel like you can use this method for more than just a career change. It walks you through trying new things and considering options that may not be typical career choices. Podcasts are excellent tools for learning and finding inspiration. I will admit, however, to not leaning into this as much as I’d like. While I like listening to podcasts, I tend to enjoy listening to music more, so most of the time, I forget to switch to a podcast when I’m out and about! The Lively Show - Jess Lively is not in her midlife years and while she doesn’t target midlife topics at all, what inspires me about her podcast is her sense of adventure and her work on ‘flow.' She lives her life by paying attention to what flows easily and where she feels resistance. Learning this was an essential part of helping me navigate the trickier parts of my Awakening journey and I still lean into this to gauge whether my decisions are on track with what’s right for me. My goal is to start listening to podcasts more often. I have several queued up in my iPhone right now that I plan to dive into over the rest of the year! To make some changes and get some clarity, you have to get your hands dirty to see what works for you. You might discover new practices that you enjoy, or it might simply serve to create an A-HA moment for you where you peel back a new layer. Journal: Journaling is always my go-to for clarity and deeper connection with myself. Something magical happens when you put pen to paper, so if you want to figure out what’s bubbling beneath the surface, it’s time to go old school and write it out. Meditate: I believe everyone should meditate because it provides so many benefits to improve your life. It reduces stress, but more importantly, after getting into the swing of it, it provides another beautiful way of connecting with yourself on a deeper level. Take up new hobbies: Discovering new hobbies benefits you in more ways that one. First, engaging in something new opens up your brain to new ways of thinking, which helps to keep your mind sharp. Second, you may discover something that you are really really good at, that may lead to finding a deeper sense of purpose or meaning. 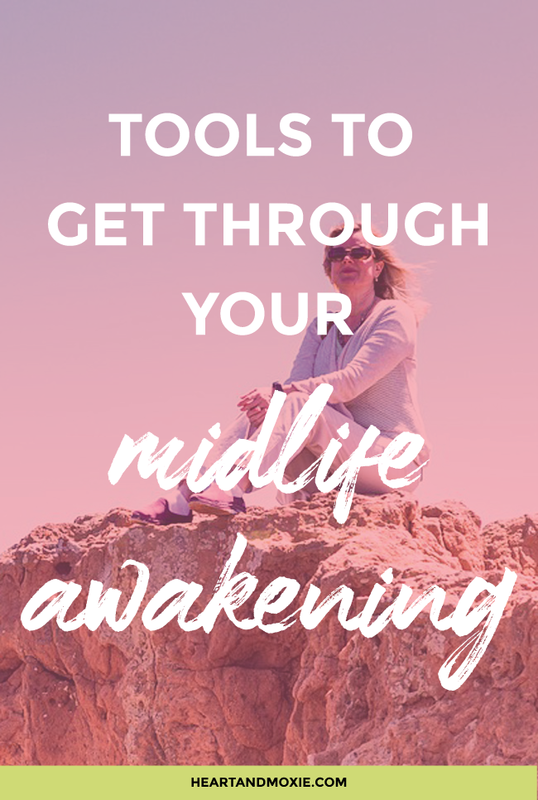 And finally, it provides that release from life that gives you a chance to get to know yourself better, which is a vital part of successfully navigating your Midlife Awakening. Oracle/Tarot Cards: Oracle and tarot cards don’t have to be for predicting the future! I love to pull these out when I want to gain further insight into myself. By drawing a few cards and reading about them, it gives me the chance to see what’s happening in my life in a different perspective. Rarely do I walk away without new insight. Travel: Traveling is my FAVORITE way to connect with myself, have fun, and lean into my curiosity. You don’t have to travel far to enjoy the benefits, so pick a place, near or far, that you’ve never been and then GO. What’s even better is to do some solo traveling. At the risk of sounding like a broken record, traveling on your own will allow you to tap into a different side of yourself and...wait for it...connect with yourself more deeply. You don’t have to go through all of this alone - one of the best ways to grow into who you are is to talk to others. Talk to your closest friends: Plan a girls night and have a heart-to-heart with your bestie to ‘get it out.' You get to share your experience and in turn, learn from hers. Talk to other women: Find other women that you admire or that you know have made the changes you crave. Understanding that the path wasn’t always easy for them can be encouraging, especially when they are now on the other side! Talk to a professional: Depending on your needs a therapist or coach can do wonders for helping you navigate this tricky time. A therapist is good for when you have unresolved issues in your past, that is preventing you from moving forward. A coach is good for when you know you want to move your life in a different direction, but you’re not sure how and you want some motivation and clarity. Your journey through your Midlife Awakening will not look like mine or anyone else’s. It’s YOUR journey, and there is no right or wrong. My desire is simply to help you navigate it with a bit more ease and confidence. You aren’t alone, and you will be okay. Embrace the discomfort and keep pushing through because on the other side is the person you are longing to be, living the life you want to live. These resources are simply suggestions to help you get to that person and that life.